On the evening of 2 June 2016, a large number of Armenian and foreign artists and art-lovers roamed across both halls of the Hamazkayin “Lucy Tutunjian” Art Gallery observing the numerous sculptures of Sculptress Nicole Berjon Bouldoukian. ​On this occasion, a few words were spoken introducing the artist and her artwork, which authentically reflects the artist's lively and vibrant creative activities. He added that each artist tries to convey through their work either a thought or an emotion; and indeed, we see either thoughts or emotions speaking to us genuinely and sincerely through Boudloukian’s work. The artist spoke a little in Armenian and a little in French. She said that theis exhibition was the result of her creative adventures of the past 4 years. A number of her sculptures are a representation of folk tale heroes whom bring to her joyful and enthusiastic memories from her childhood. She had revived her favorite heroes by sculpting them as she had envisioned them and sketched their images in her memories. Bouldounkian had started to conceive her “Les Ménines”, after visiting Museo del Prado in Madrid and The Museu Picasso in Barcelona. 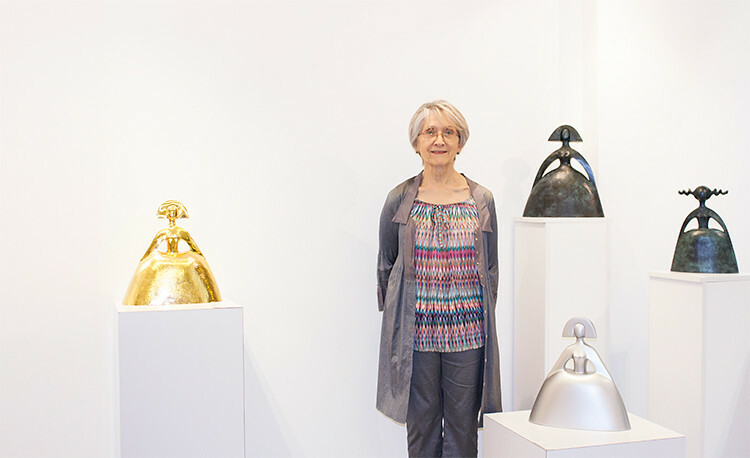 Through her experience, Berjon creates contemporary artwork using either bronze, resin, clay (terracotta), or sandstone. Bouldoukian said she had given privilege to the “group” over the individual creating sculptures that include 2, 3, or 4 individuals to make one whole unit. She ended her word stating that with this exhibition, this phase of her creative adventure ends, and a new one begins. The exhibition continues until June 18. The Hamazkayin Art Gallery is open every day except Sundays from 9:30 am until 6:30 pm.